Heaven gained an angel when Stuart L. Melchert passed away on June 26, 2018. Stu was born in Salem, OR to Maurice Melchert and Juanita Geiss. He is survived by his wife, Janice Mannin Melchert, sons Michael (Donna), David (Deanna), and Russell (Stephanie), eight grandchildren, and two great grandchildren. Stu grew up in Newton, KS and served our country in the Army in Korea. 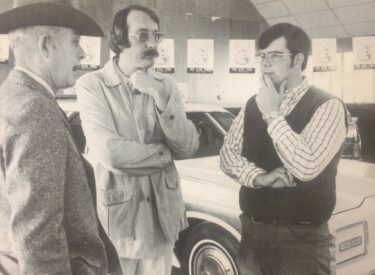 Stu was a mentor and leader with 50+ years of work in broadcast radio where he worked for three generations of Landons (Alf, Jack, Nancy Landon Kassebaum, and Bill Kassebaum) at Seward County Broadcasting Co. He was a member of the Kansas Broadcasting Hall of Fame. Stu was well known as a gentle man who made friends everywhere he went loving life along the way. Stu enjoyed traveling with Janice, fly fishing in New Mexico and spending time with family and friends. A memorial service will be held Saturday, July 7, at 11am at St. Paul’s Cathedral in Oklahoma City. In lieu of flowers, the family requests donations be made to St. Paul’s Episcopal Cathedral, 127 NW 7th St, Oklahoma City, OK 73102 or to the Stuart Melchert Voice of Excellence Memorial Scholarship, c/o Liberal Chamber of Commerce Foundation, PO Box 676, Liberal, KS 67905.